Hand-held pads are available for the items below on our Hand-held pads page. Premium zirconia alumina abrasive. A full phenolic resin bond system plus latex. E-weight latex paper back. Listed below with three different fastening options. File boards are listed on our Hand-held pads page. 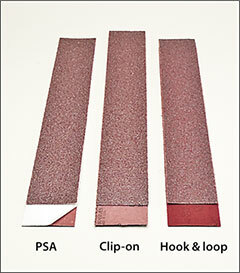 Hook and loop sheets sold by the pack, 25/pack. sold by the pack, 50/pack. Aluminum oxide, open coat, glue bond sander sheets. A-weight is thinnest and most flexible. C and D-weights are thicker and less flexible paper. 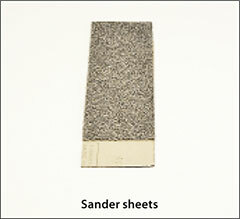 Other available cut sheets include silicon carbide abrasive grit on either waterproof or lubricated sheets. Please call us for a quote. Sold by the pack, 100/pack. WARNING: Proposition 65 Label for 3" x 8" sheets .